The games are now more important than at the beginning of the Regular Season. We may still expect few shocking results in upcoming 6 rounds. There was no lack of excitement in the last round games. The round ended with change at the leadership position and favorites losing the games. Here is the last round review presented by ESL. There was a change at the LNBP leadership position after last games. Round 36 most important game was a defeat of league's leader Soles (20-12). They were crushed by second ranked Capitanes (21-12) 109-77 on Saturday night. It ended at the same time the five-game winning streak of Soles. It was a key game for the top position in the league. Capitanes shot the lights out from three sinking 15 long-distance shots on high 55.6 percentage. They looked well-organized offensively handing out 24 assists. Worth to mention a great performance of Dominican guard Rigoberto Mendoza (190-92) who helped to win the game recording 37 points (!!! ), 5 rebounds and 7 assists and Cuban center Ismael Romero (203-91) who added 31 points and 5 rebounds (on 13-of-16 shooting from the field) during the contest. The best for the losing side was American-Dominican Antonio Pena (204-86, college: Villanova) with 17 points and 5 assists. 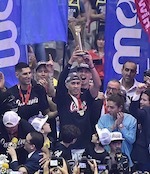 Capitanes keep a position of league leader. Soles at the other side dropped to the second place with 12 games lost. They were replaced at the leadership position by Fuerza Regia. Soles will play next round against Libertadores trying to make it back to the top of the standings. Capitanes will have a break next round, and it should allow them to practice more before next game. The game had a very big importance for first-ranked Soles as it allowed them to take a leadership position. Soles defeated second-best Capitanes in Mexico 106-101. It may be a crucial game in the contest for the top position in the league. The winners were led by American forward Branden Dawson (198-93, college: Michigan St.) who had that evening a double-double by scoring 22 points and 11 rebounds and Aaron Valdes supported him with 18 points and 5 rebounds. Even a double-double of 25 points, 11 rebounds and 4 assists by the former international Hector Hernandez (205-85, college: Fresno St., agency: BeoBasket) did not help to save the game for Capitanes. Soles (20-12) have an impressive five-game winning streak. As mentioned above they took over a top position. Capitanes at the other side still keep top place with 12 games lost. Capitanes will have a break next week, which should allow them to rest in order to get back on the winning path. Soles will try to continue on its current victory against sixth ranked Libertadores at Queretaro. A very close game took place in Michoacan between Aaguacateros and Panteras. Third ranked Aaguacateros (19-12) got a very close home victory over one of their biggest challengers Panteras (16-17). Aaguacateros managed to escape with a 1-point win 88-87 in the fight for the third place. Americans were the main players on the court. The best player for the winners was Dominic McGuire who had a double-double by scoring 19 points, 10 rebounds and 5 assists. At the other side the best for losing team was Hameed Ali who recorded 20 points, 9 rebounds and 9 assists. Aaguacateros maintains third position with 19-12 record having 2 victories less than leader Fuerza Regia. Loser Panteras keep the fourth place with 17 games lost. Aaguacateros will meet Abejas (#5) in the next round. Panteras will play against Angeles and hope to secure a win. A very interesting game took place in Michoacan. It ended with only two-point defeat on the road of one of their biggest challengers Laguneros (16-18) to third ranked Aaguacateros (19-12) 92-90 in the fight for the third place. It was a good game for Eduardo Gonzalez who led his team to a victory with 25 points and 8 assists (went 10 for 10 at the free throw line !!!). Laguneros' coach rotated ten players in this game, but that didn't help. Aaguacateros maintains third position with 19-12 record having 2 victories less than leader Fuerza Regia. Newly promoted Laguneros keep the fourth place with 18 games lost. Aaguacateros' next round opponent will be Abejas (#5) in Guanajuato. Very important is a home loss of third ranked Aaguacateros (19-12) against fourth ranked Laguneros (16-18) on Saturday night. Host Aaguacateros were defeated by Laguneros in Michoacan 85-70. It ended at the same time the two-game winning streak of Aaguacateros. Americans were the main players on the court also this time. Worth to mention a great performance of Mychal Ammons who helped to win the game recording 19 points and 7 rebounds. Newly promoted Laguneros maintains fourth position with 16-18 record. Loser Aaguacateros keep the third place with 12 games lost. Laguneros will have a break next round. Aaguacateros will play on the road against Abejas in Guanajuato and it may be a tough game between close rivals. There were no shocking results in the other games in round 36: Lenadores destroyed Huracanes on the opponent's court 92-72. 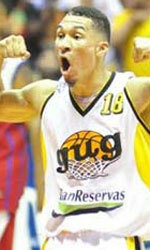 Fuerza Regia managed to outperform Santos in a home game 94-85. Lenadores rolled over Huracanes on the road 97-74. Libertadores defeated Abejas on its own court 90-83. Very expected game in Tampico where 7th ranked Huracanes (6-28) were crushed by third ranked Lenadores (20-14) 92-72 on Thursday. Lenadores dominated down low during the game scoring 56 of its points in the paint compared to Huracanes' 32 and made 18-of-21 free shots (85.7 percent) during the game. Lenadores looked well-organized offensively handing out 25 assists comparing to just 9 passes made by Huracanes' players. Worth to mention a great performance of forward Jorge Camacho (203-89, college: E.Kentucky) who helped to win the game recording a double-double by scoring 18 points and 11 rebounds and American-Puerto Rican Javier Mojica (190-84, college: Cent.Conn.St.) who added 20 points and 7 rebounds during the contest. Five Lenadores players scored in double figures. The best for the losing side was American forward Timajh Parker-Rivera (202-94, college: Towson) with a double-double by scoring 19 points and 10 rebounds (on 8-of-10 shooting from the field) and naturalized American guard Martin Samarco (190-85, college: Bowling Green) scored 15 points and 6 rebounds. Lenadores have a solid three-game winning streak. Newly promoted Lenadores maintains third position with 20-14 record behind leader Fuerza Regia. Huracanes lost fourth consecutive game. Huracanes at the other side, also newcomer in the league, keep the seventh place with 28 games lost. Lenadores will face Santos (#6) in San Luis Potosi in the next round. Huracanes will play at home against Correcaminos and it may be a tough game between close rivals. Very predictable result in Monterrey where first ranked Fuerza Regia (29-7) defeated 6th ranked Santos (11-23) 94-85 on Friday. They outrebounded Santos 46-25 including a 32-13 advantage in defensive rebounds. Fuerza Regia looked well-organized offensively handing out 24 assists. Worth to mention a great performance of Nigerian center Jeleel Akindele (216-83, college: Chicago St., agency: BeoBasket) who helped to win the game recording a double-double by scoring 22 points, 13 rebounds and 7 assists and American forward Jordan Glynn (200-89, college: SF Austin) who added 21 points and 7 rebounds during the contest. Four Fuerza Regia players scored in double figures. The best for the losing side was American forward Lyonell Gaines (198-93, college: Morehead St., agency: Best of You Sports) with 29 points and 7 rebounds and his fellow American import forward BJ West (211-89, college: Jackson St.) scored 25 points and 7 rebounds. Fuerza Regia have an impressive 13-game winning streak. They maintain first position with 29-7 record. Santos lost third consecutive game. They keep the sixth place with 23 games lost. Fuerza Regia will face again Santos (#6) in San Luis Potosi in the next round where they are favorite. Santos will play against Lenadores and hope to win that game. Not a big story in a game in Tampico where 7th ranked Huracanes (6-28) were rolled over by third ranked Lenadores (20-14) 97-74 on Saturday. Lenadores made 16-of-21 free shots (76.2 percent) during the game. Lenadores outrebounded Huracanes 42-30 including 28 on the defensive glass. They looked well-organized offensively handing out 27 assists. Worth to mention a great performance of the former international forward Stephen Soriano (200-85, college: Colorado Mesa) who helped to win the game recording 16 points and 6 rebounds and American-Lebanese power forward Jarrid Famous (209-88, college: S.Florida) who added 13 points and 10 rebounds during the contest. The best for the losing side was American guard Roberto Nelson (190-91, college: Oregon St., agency: Best of You Sports) with 16 points, 6 rebounds and 5 assists and U.S. Virgin Islands-American forward Jamaal Samuel (206-93, college: La-Monroe) scored 13 points and 7 rebounds. Five Lenadores and four Huracanes players scored in double figures. The winner was already known earlier in the game, so both coaches allowed to play the bench players saving starting five for next games. Lenadores have a solid three-game winning streak. Newly promoted Lenadores maintains third position with 20-14 record behind leader Fuerza Regia. Huracanes lost fourth consecutive game. Huracanes at the other side, also newcomer in the league, keep the seventh place with 28 games lost. Lenadores will face Santos (#6) in San Luis Potosi in the next round. Huracanes will play at home against Correcaminos and it may be a tough game between close rivals. The game had a very big importance for first-ranked Soles as it allowed them to take a leadership position. Soles defeated second-best Capitanes in Mexico 106-101. It may be a crucial game in the contest for the top position in the league. Soles players were unselfish on offense dishing 22 assists. The winners were led by American forward Branden Dawson (198-93, college: Michigan St.) who had that evening a double-double by scoring 22 points and 11 rebounds and the other American import guard Aaron Valdes (196-93, college: Hawaii, agency: Pro Sports) supported him with 18 points and 5 rebounds. Even a double-double of 25 points, 11 rebounds and 4 assists by the former international Hector Hernandez (205-85, college: Fresno St., agency: BeoBasket) did not help to save the game for Capitanes. Panamanian forward Ernesto Oglivie (203-89) added 14 points and 12 rebounds. Four Soles and five Capitanes players scored in double figures. Soles (20-12) have an impressive five-game winning streak. As mentioned above they took over a top position. Capitanes at the other side still keep top place with 12 games lost. Capitanes will have a break next week, which should allow them to rest in order to get back on the winning path. Soles will try to continue on its current victory against sixth ranked Libertadores at Queretaro. A very close game took place in Michoacan between Aaguacateros and Panteras. Third ranked Aaguacateros (19-12) got a very close home victory over one of their biggest challengers Panteras (16-17). Aaguacateros managed to escape with a 1-point win 88-87 in the fight for the third place. Americans were the main players on the court. The best player for the winners was Dominic McGuire (206-85, college: Fresno St.) who had a double-double by scoring 19 points, 10 rebounds and 5 assists. Point guard Tyrone White (201-90, college: CSU Bakersfield) chipped in 21 points. At the other side the best for losing team was guard Hameed Ali (188-93, college: Texas A&M-CC) who recorded 20 points, 9 rebounds and 9 assists and Tony Criswell (205-91, college: Missouri) added 24 points and 6 rebounds respectively. Five Panteras players scored in double figures. Aaguacateros maintains third position with 19-12 record having 2 victories less than leader Fuerza Regia. Loser Panteras keep the fourth place with 17 games lost. Aaguacateros will meet Abejas (#5) in the next round. Panteras will play against Angeles and hope to secure a win. We could consider it a predictable result in the game between close teams in Queretaro where sixth ranked Libertadores (12-21) beat 5th ranked Abejas (14-20) 90-83 on Friday. Worth to mention a great performance of American forward Anthony Young (200-89, college: Ky Wesleyan) who helped to win the game recording a double-double by scoring 30 points and 10 rebounds and the former international guard Cezar Guerrero (185-92, college: Fresno St., agency: Best of You Sports) who added 10 points and 7 assists during the contest. The best for the losing side was American guard Spencer Williams (188-95, college: Wooster) with 22 points and 4 assists and American-Panamanian point guard Trevor Gaskins (188-89, college: Louisiana Tech, agency: Pro Sports) scored 15 points, 6 rebounds and 4 assists. Both teams had four players each who scored in double figures. Libertadores maintains sixth position with 12-21 record. Abejas lost third consecutive game. They keep the fifth place with 20 games lost. Libertadores will face league's second-placed Soles in Mexicali in the next round and it may be quite challenging game. Abejas will play at home against Aaguacateros and it may be a tough game between close rivals. There was a change at the LNBP leadership position after last games. Round 36 most important game was a defeat of league's leader Soles (20-12). They were crushed by second ranked Capitanes (21-12) 109-77 on Saturday night. It ended at the same time the five-game winning streak of Soles. It was a key game for the top position in the league. Capitanes shot the lights out from three sinking 15 long-distance shots on high 55.6 percentage. They looked well-organized offensively handing out 24 assists. Worth to mention a great performance of Dominican guard Rigoberto Mendoza (190-92) who helped to win the game recording 37 points (!!! ), 5 rebounds and 7 assists and Cuban center Ismael Romero (203-91) who added 31 points and 5 rebounds (on 13-of-16 shooting from the field) during the contest. The best for the losing side was American-Dominican Antonio Pena (204-86, college: Villanova) with 17 points and 5 assists and American guard Kohl Meyer (190-93, college: Puget Sound) scored 13 points. Capitanes keep a position of league leader. Soles at the other side dropped to the second place with 12 games lost. They were replaced at the leadership position by Fuerza Regia. Soles will play next round against Libertadores trying to make it back to the top of the standings. Capitanes will have a break next round, and it should allow them to practice more before next game. A very interesting game took place in Michoacan. It ended with only two-point defeat on the road of one of their biggest challengers Laguneros (16-18) to third ranked Aaguacateros (19-12) 92-90 in the fight for the third place. Aaguacateros made 23-of-29 charity shots (79.3 percent) during the game. They shot the lights out from three nailing 13 long-distance shots on high 52.0 percentage. Aaguacateros brought some defensive toughness making 9 blocks. It was a good game for Eduardo Gonzalez (-89) who led his team to a victory with 25 points and 8 assists (went 10 for 10 at the free throw line !!!). American center Maurice Sutton (211-89, college: Villanova) contributed with 21 points, 9 rebounds and 6 blocks for the winners. American guard Rayes Gallegos (188-90, college: Nebraska) replied with 32 points and his fellow American import forward Mychal Ammons (198-92, college: S.Alabama) added 19 points and 5 rebounds in the effort for Laguneros. Four Laguneros players scored in double figures. Laguneros' coach rotated ten players in this game, but that didn't help. Aaguacateros maintains third position with 19-12 record having 2 victories less than leader Fuerza Regia. Newly promoted Laguneros keep the fourth place with 18 games lost. Aaguacateros' next round opponent will be Abejas (#5) in Guanajuato. Very important is a home loss of third ranked Aaguacateros (19-12) against fourth ranked Laguneros (16-18) on Saturday night. Host Aaguacateros were defeated by Laguneros in Michoacan 85-70. It ended at the same time the two-game winning streak of Aaguacateros. Laguneros forced 19 Aaguacateros turnovers. Strangely Aaguacateros outrebounded Laguneros 40-27 including 29 on the defensive glass. Americans were the main players on the court also this time. Worth to mention a great performance of forward Mychal Ammons (198-92, college: S.Alabama) who helped to win the game recording 19 points and 7 rebounds and guard Rayes Gallegos (188-90, college: Nebraska) who added 14 points, 5 rebounds and 6 assists during the contest. The best for the losing side was center Maurice Sutton (211-89, college: Villanova) with a double-double by scoring 14 points and 12 rebounds and Dominic McGuire (206-85, college: Fresno St.) scored 12 points, 6 rebounds and 5 assists. Both teams had four players each who scored in double figures. Newly promoted Laguneros maintains fourth position with 16-18 record. Loser Aaguacateros keep the third place with 12 games lost. Laguneros will have a break next round. Aaguacateros will play on the road against Abejas in Guanajuato and it may be a tough game between close rivals.